People throughout ancient history were just as worried about their appearance and personal hygiene as we are today! ; The Romans for example, had bath houses, where people could swim, visit a sauna, bathe in a series of hot and cold plunge pools and get a massage. To accompany their personal grooming and cosmetic activities, people would have used toilet articles or a cosmetic set. 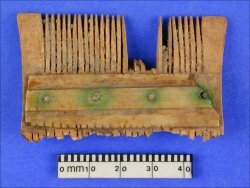 Cosmetic sets may have included combs, used to disentangle hair. Some of the combs in our collection are made from bone and date from between the Roman and Medieval periods.